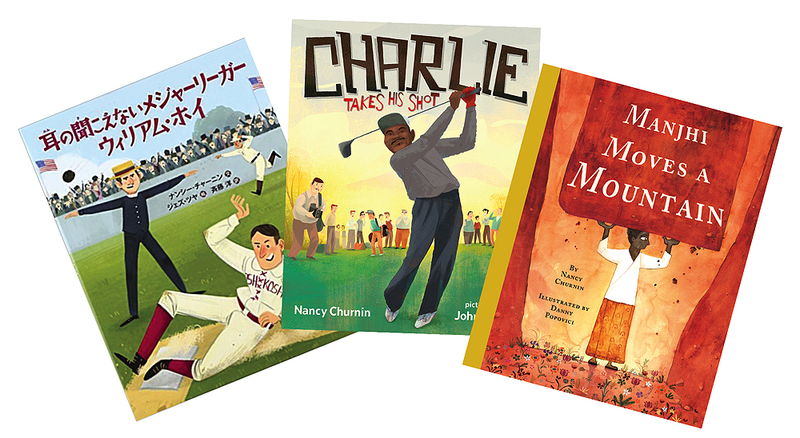 Nancy Churnin’s biographies for children span time and space. When Nancy Churnin ’78 was a child, she had a notebook that went everywhere with her; in it, she scribbled poems, stories, and drawings. That love for writing continued into a career in journalism, most recently as theater critic for The Dallas Morning News. At first, Churnin thought it wouldn’t be all that hard, as a professional journalist, to write a children’s book. “But I realized children’s books are an entirely different art form,” she says. To “learn the craft,” she got involved in several writers’ groups, including the Society of Children’s Book Writers and Illustrators and 12 x 12. The first gave her a chance to share her writing with other children’s-book writers and get feedback; 12 x 12 challenged her to write 12 manuscripts in 12 months. In June 2013, she submitted her Hoy draft to 12 x 12’s Agent of the Month, who wrote back to her the very same day. But writing nonfiction for four- to eight-year-olds isn’t easy. “These books have to be less than a thousand words. I have to make sure the story reflects the essence of the individual and also resonates with the children who read them.” After several revisions, the book appeared in 2016; both the New York Public Library and School Library Journal included it on their lists of Best Kids Books that year. All Churnin’s children’s books describe people who brought change, for themselves and others. After The William Hoy Story came Manjhi Moves A Mountain—about an Indian man who carved a path through a mountain, using only a hammer and a chisel, to connect his village to a neighboring one with more resources. Her newest book, Charlie Takes His Shot: How Charlie Sifford Broke the Color Barrier in Golf, appears in January. “Too often,” she says, “textbooks don’t allow room for personal stories that can bring a period of history to memorable life and give a child a feeling of what it felt like to live through those times.” To help teachers make that happen, Churnin provides free downloadable teachers’ guides with all her books, and visits classrooms in person, or via Skype.